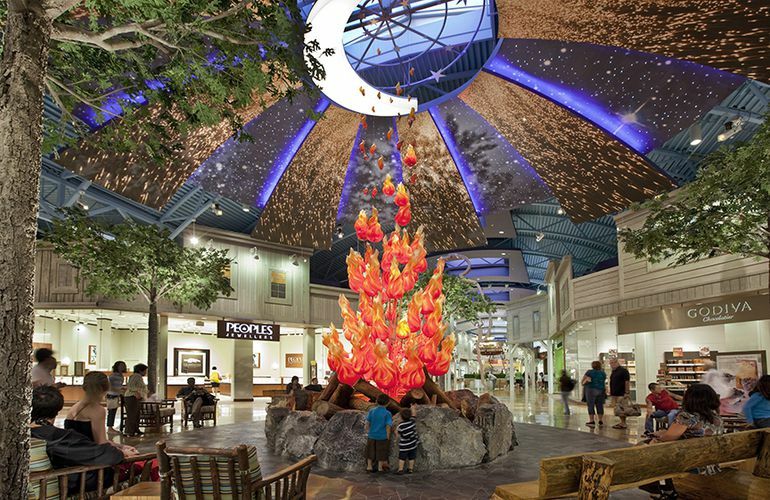 One of the major distinguishing features of a Mills concept centre is the design. With over 1.4 million square feet on a single level, connected by 2.7 km of internal raceway, visual appeal and architectural variation is vital in creating aesthetic interest. The concept was to divide the centre into “Neighbourhoods” that have themes representative of the local area. 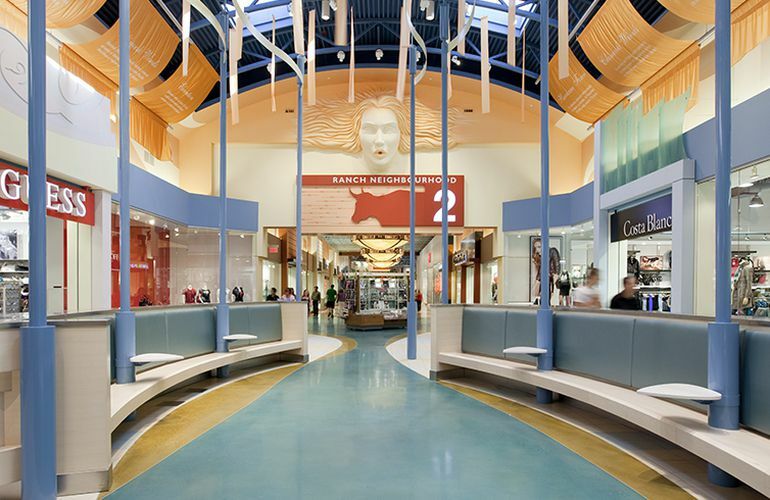 The architecture of CrossIron Mills is innovative, contemporary and reflects Alberta’s unique heritage. The design elements celebrate the geographic regions, memorable landmarks and cultural icons of the province. The interior is divided into 6 themed neighbourhoods: Fashion, Ranch, Resources, Fossil, Sport and Entertainment Neighbourhood. The Fashion Entrance is on the far NW side of the centre and is characterized by what we affectionately refer to as the ‘Gumby Girl’ outside and leads into the Fashion Neighbourhood which has 12 ft store fronts & carpet flooring while other areas have 9ft store fronts and flooring includes terazzo, tile, stained concrete, marmoleum and 7 different varieties of hardwood. 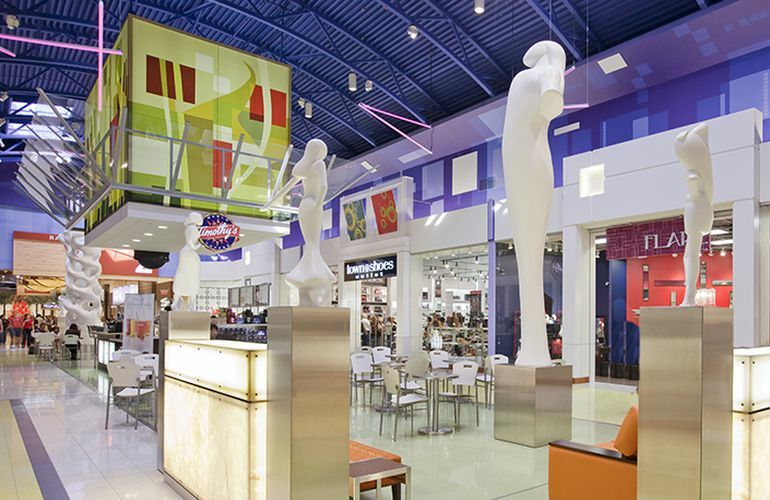 The Fine Arts Court transitions from the Fashion to Ranch neighbourhoods and features geometric shapes, bright colors, stark white abstract sculptures and a coffee shop with spacious seating area. The Ranch Neighbourhood is a nod to the Old West. It is often referred to as the Ranch Spine as it runs through the middle of the centre. The Ranch Neighbourhood boasts 8 different types of hardwood flooring with theatrical western store fronts and huge sheriffs badges in-set in the floor at either end. Also at opposite ends of the Ranch Neighbourhood are the “Good Guy” and “Bad Guy” gunslingers that stand at 23 feet tall, and customers walk beneath them as they enter the space. The Campfire Court is at the West end of the ranch spine and is designed as a night sky with stars, the moon and embers from the blown glass fire which is surrounded by tall trees and rustic log furniture. The ceiling treatment transitions from this court through the Ranch Neighbourhood getting lighter and lighter to far end where the rodeo court is in full sun. The Rodeo Court is bright and airy, depicting many of the rodeo events with 4 metal sculptures of a saddle bronc rider, a roping cowboy, a bull rider and a steer wrestler. Stylized cowboys look down on the Rodeo Court from their perch on the coral rail above. The Wind Court transitions between the Ranch and Resources Neighbourhoods and is inspired by the Chinook winds that are such a major part of Alberta culture. Here you find our Chinook girl gently blowing wind across ribbons and banners at the ceiling level to create activity. In this court is a central seating area of wave shaped benches and if you look up you’ll see several banners with facts and lore about the Chinook Winds. The Resource Neighbourhood highlights the importance of agriculture, wind & of course oil & gas in Alberta. With an enormous stylized oil derrick as the entrance icon, this neighbourhood contains sculptures representing fields of grain, hay accented store fronts, giant overhead ceiling fans and an interactive piece of modern art modeled after a working oil rig. Children can turn the wheels and watch the ‘oil’ bubble through the rig. The Fossil Neighbourhood was designed as a tribute to the badlands of Alberta. With Drumheller and the Royal Tyrrell Museum mere hours away we thought it was an important aspect of Alberta history to incorporate. Natural Cork linoleum represents the strata of earth as you dig for fossils. 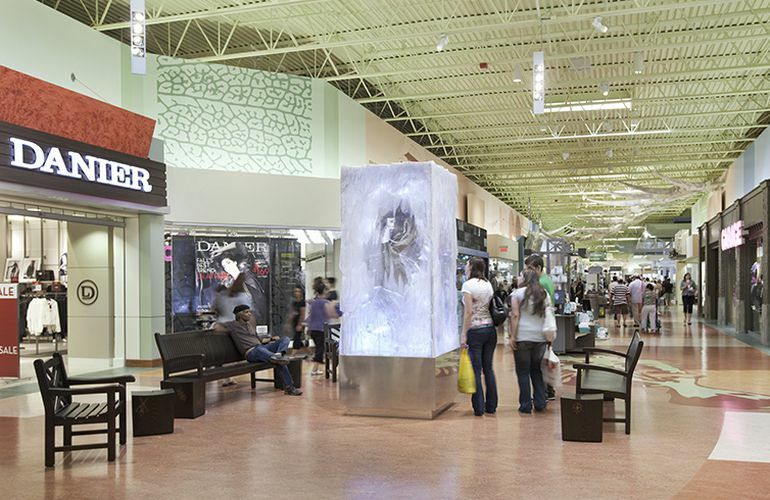 This area also features 2 more unique sculptures, the ‘Layers of Time’ statue representing the ‘fossils’ left behind from various eras, and the ‘CrossIron Caveman’ holding a coffee and shopping bags frozen in a block of ice. The Little Fossil Fun Zone Play Park creates a break heading into the Fossil Neighbourhood which has interesting natural rock seating areas and displays a curving spine and rib bones of a dinosaur hanging in the ceiling space as well as Origami-styled flying dinosaurs in the far court area. 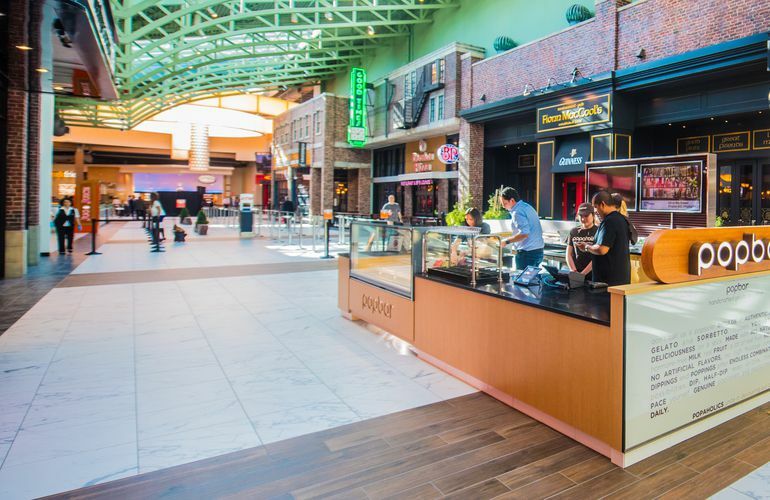 The new and improved food hall now offers 1,400 seats and 24 restaurants and features a new entrance located on the northern side of the property. This access features a 40-foot-high (12-metre) glass vestibule, a curved metal roof, and a glass curtain wall with metal columns and masonry accents. Its strategic location and the food hall’s numerous skylights improve brightness as well as enhance the overall shopping experience at the centre. 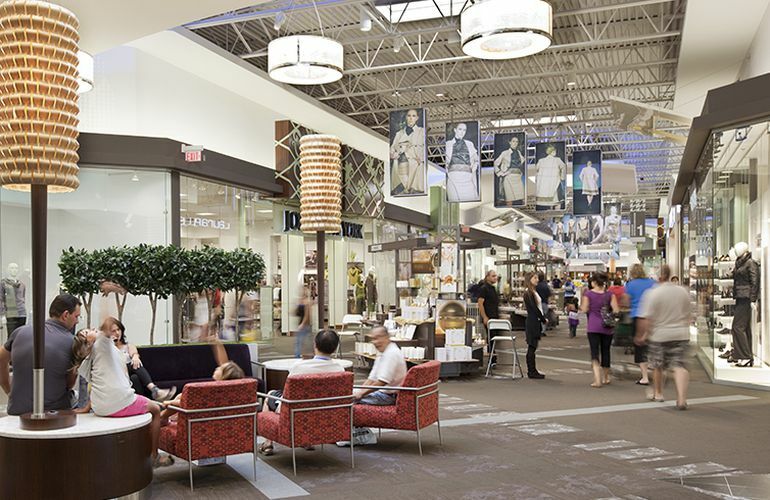 As part of CrossIron Mills’ commitment to sustainable development, the food hall now includes a larger green room and improved recycling amenities. A bigger nursing room, as well as two large family rooms, are adjacent to the modern food hall washrooms. 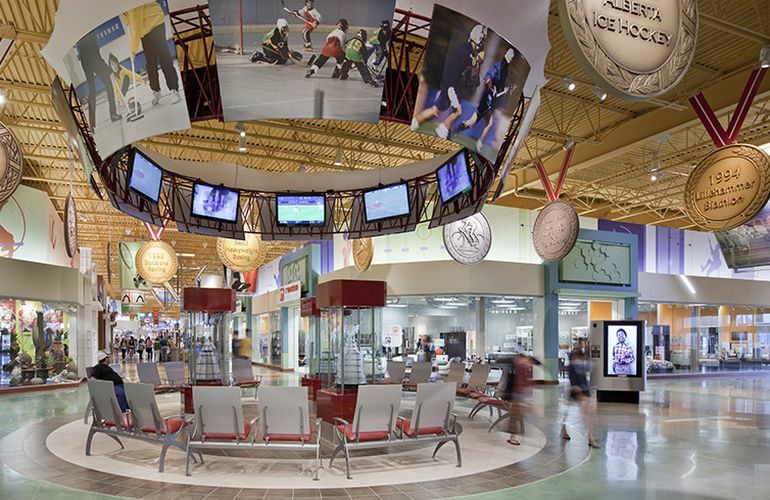 The “Court of Champions” can be found in the Sport Neighbourhood entry Court…A suspended ring hangs center court with stadium seats below, displaying still and broadcast imagery representative of the diversity of Sport and its many levels of participant. The trophy cases and hanging medals above give interesting fact and recall the pay‐off of the hard fought competitions of days past. Throughout the Sports Neighbourhood, winter is also represented with a chairlift feature, incorporating embossed graphic wood chair slats featuring names and locations of Alberta’s best and the Summer Sport seating “oasis” area includes a nod to “Spruce Meadows” and the equestrian world…while the ceiling beyond showcases a tight race, as stylized rowing skulls battle toward the finish line through accent lighting featured cast acrylic ‘water’ panels. 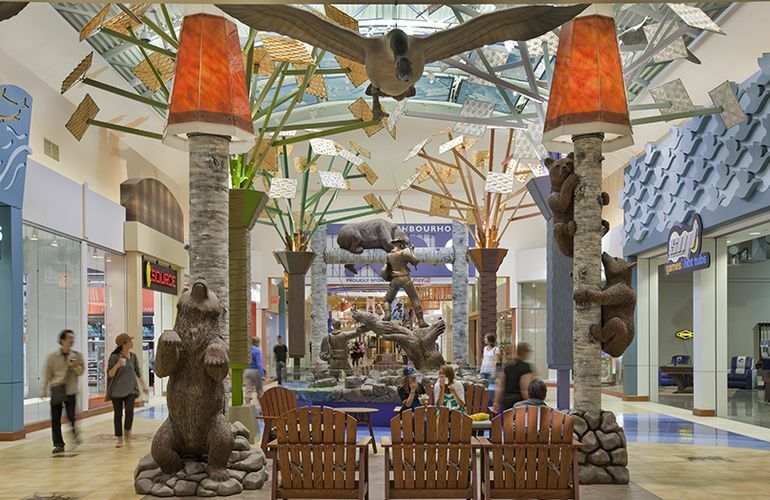 The Wildlife Court transitions from the Sports Neighbourhood to one of our major anchor tenants, Bass Pro Shops, and acknowledges the beauty and natural diversity of Alberta with stylized trees line the water edge. Along each side of the water, you’ll find a clearing, where you can rest on rustic style furniture, and almost hear the sleeping bear snore as he rests atop to log formed lighting arch. Animal images, etched in bronze tiles, dot the surrounding floor, artfully displaying different styles to capture their image. Above, rear illuminated transparent blue images of Alberta wildlife represent some of the great diversity that can be found. Flying gracefully above the trees, carved geese sculptures transition from simple carved geese forms to detailed representations as they exit the Court towards Bass Pro Shops. The Entertainment Neighbourhood adds approximately 200,000 square feet of additional retail space and common area which is modeled after a dynamic, energised 1930’s urban area. 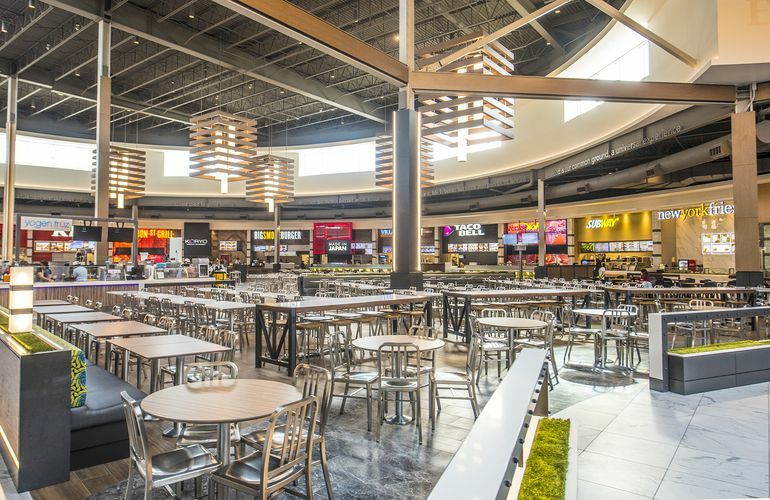 The Entertainment Neighbourhood is home to a 45,000 square foot SilverCity entertainment centre, three fully licensed sit-down restaurants; Boston Pizza and Fionn McCool’s and Milestones. The state-of-the-art SilverCity entertainment area features more than 1,300 stadium seats and 7 auditoriums with wall-to-wall curved screens and digital surround sound. 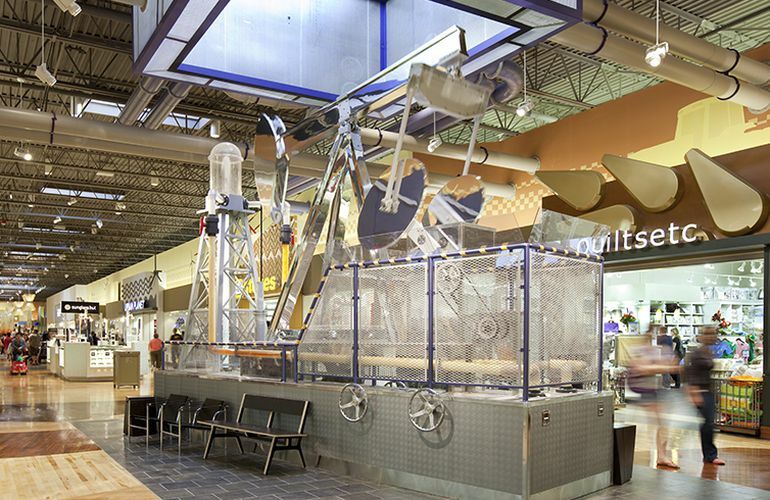 In addition, guests can enjoy the amenities in the approximately 13,000 square foot XSCAPE Entertainment Centre which features a variety of the latest games and activities as well as a licensed lounge. Select auditoriums have RealD 3D technology where guests will be able to enjoy a totally immersive 3D experience like no other.